Located near the intersection of W. Tropicana Blvd. and S. Jones Blvd. a few minutes west of The Strip, Extra Space Storage serves Las Vegas residents near Spring Valley. 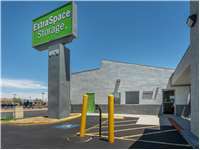 Locals will recognize our facility across from Tropicana Marketplace next to Subway and Mega Dollar. We're also accessible for residents of nearby apartments, such as Foothill Village Apartments, Sedona Ridge, Royal Palms Apartments, Tower at Tropicana, Torreyana Apartments, Winsome West Apartments, and Meadow Ridge Apartments. National Street Teams has been using Extra Space Storage for all our storage needs in multiple states and cities for years. Heather over at the Tropicana near Jones location is by far the best Manager I have ever had the privelage of being a customer with. She is always courteous & goes out of her way to help out her customers. She runs the facility like a true professional keeping it safe,clean and a friendly enviroment for all her customers. Heather is one of the main reasons we as a company continue to use Extra Space Storage all over the country for our storage needs! The storage units are clean, proper secure pull down 'gates' on the storage units and management live on site. Amber was very helpful. I called her whilst she was away from her desk but she continued to disclose all information I needed to know including all necessary costs. I then set up my reservation on line. This was followed by a phone call from the storage company - the lady once again confirmed my reservation AND ALL NECESSARY COSTS. I am stressing the 'all necessary costs' because the day before, I went to another storage company and halfway signing up, I was given a bill that contained things I wasnt aware of!! It also included me having to buy their lock!! I thought that was just bad business practice and who knows what else they may charge me for! Not to mention the storage unit was like a cardboard box with a door!! Not very secure for me! I am glad I cancelled and instead went to 'Extra Space' where everything was the same price, newer, better security and professional. I have been pleased with the service I have received here. They have been very helpful, I've had to change from small to a larger size and they were very helpful. I think you will be pleased with this facility. JS. This is my first time using a storage unit. I choose extra space as it was the best value out there. This facility manger Melinda is great she and her asisstent Sheri take great pride in the facility. It's always clean and well maintanted. It's a pleasure doing bussiness there. I would recommend this facility to my friends for sure. It's a 5 sta rate for sure. Absolutely the "BEST" Storage Facility That we have ever used.... 1. Clean 2. Secure 3. Conveinent 4. Helpful Staff Thank You So Much! Noi S.
It's like meeting with friends instead of business. It's nice to have friendly people assisting us. So far there have been no negatives regarding the property. Thank you. I have been at this storage location for 20 years. When Extra Space took over, I din't know what to expect. But, they have done a wonderful job at keeping track of my needs. I live out of town and they let me know whenever there is a change or I need to make a payment before it's due. I like that type of customer service. Drive south on S Torrey Pines Dr. Pass Kenny C. Guinn Middle School STEM Academy and continue south on S Torrey Pines Dr. Turn left onto W Tropicana Ave. Our facility is on your right, just before S Jones Blvd. Drive north on S Rainbow Rd. Pass Spring Valley Hospital Medical Center and continue straight on S Rainbow Blvd. Turn right onto W Tropicana Ave. Our facility is on your right, just after Foothill Village Apartments. Drive west on W Tropicana Ave. Make a U-Turn at the main entrance for Foothill Village Apartments to head east on W Tropicana Ave. Our facility is immediately on your right. Drive east on W Tropicana Ave. Our facility is on your right, just before S Jones Blvd.